Totally Wicked, the UK’s leading independent electronic cigarette manufacturer, will formally challenge the validity of Article 20 of the EU Tobacco Products Directive (TPD) at the Court of Justice of the EU (CJEU) in Luxembourg on Thursday the 1st of October 2015. The CJEU’s decision, expected early next year, will determine whether Article 20 of the TPD breaches EU law. The hearing follows a decision by the High Court in London on 6th October 2014 to refer questions relating to the lawfulness of Article 20 to the CJEU for a “preliminary reference” ruling….. Totally Wicked are sending out a call to all vapers: come and support us as we hand over our petition – your petition. The 50,000+ names on the list will be delivered to the Department of Health at Richmond House, 79 Whitehall, London SW1A 2NS. The handover will taker place at 11am on the 29th of September…. 2. Get to London to the Department of Health in Whitehall for 11am next Tuesday for the handover of the Legal Challenge (http://article20legalchallenge.com/) supporters list. 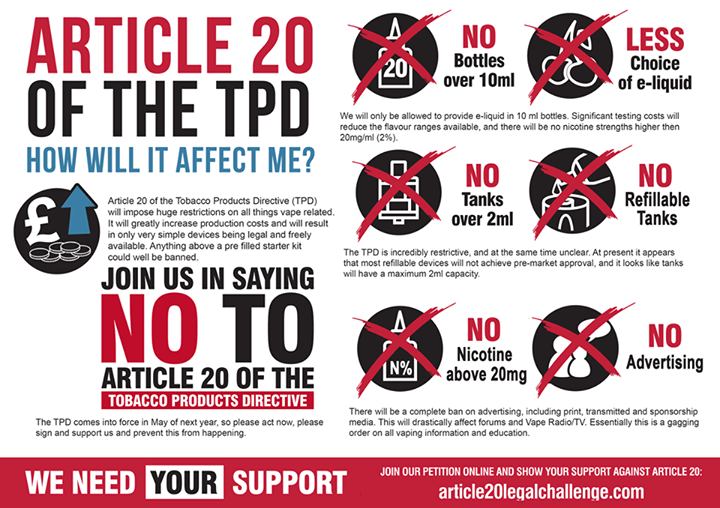 Sign up for the Thunderclap from @vapers to support the Challenge (http://thndr.it/1PBlNpU) and share it on Facebook and/or Twitter. Is “ecigs are a gateway” the new “addiction”? An important new study led by Dr. Christopher Russell of the Centre for Drug Misuse Research in Glasgow and presented recently at the 2015 Tobacco Science Research Conference reveals that contrary to the claims of many anti-tobacco advocates, dual use (of e-cigarettes and tobacco cigarettes) is not a negative consequence of e-cigarette use, but a positive outcome that could well stand on a pathway to eventual smoking cessation…. The tobacco industry’s united front is being tested as Imperial Tobacco Group Plc takes a swipe at Philip Morris International Inc.’s new cigarette alternative. About 40 people, mostly e-cigarette store owners and other advocates of “vaping,” turned up at a health department hearing Wednesday night — delayed to account for crawling traffic and road closures related to China President Xi Jinping’s visit to nearby Lincoln High School — to describe their concerns over bringing vapor products into line with Washington’s smoking in public places law…. This is illegal and outright immoral. Why am I not surprised?